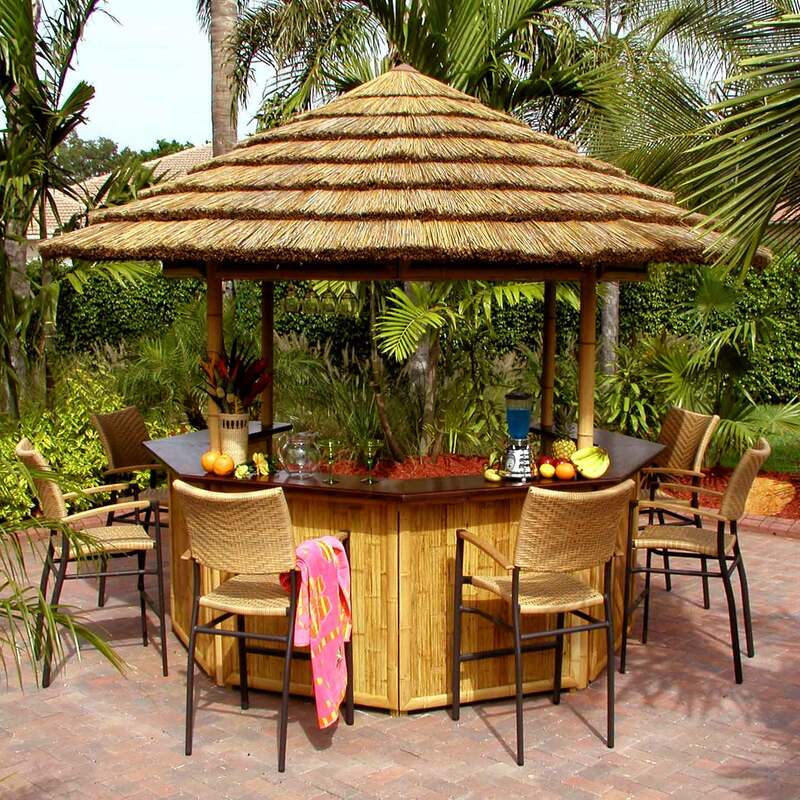 Bar: Oasis Bar This 9ft wide octagonal-base bar, has an 12.5ft dia thatched roof with your choice of thatch. This is essentially a much larger version of Safari’s Bimini Bar, with beautiful made-in-the-USA GRASSBuilt engineered bamboo countertops, choice of thatch, duracane sleeved poles, and bamboo plywood facades all come standard, and provide truly stylish outdoor entertaining. Highly resistant to harsh weather, this bar is built to last. Replacement thatch is easy to order and install. Personalize your purchase with custom resin-pour counters, different types of thatch, and custom installed appliances, and with the sheer size of this bar, the options are ultimately endless. 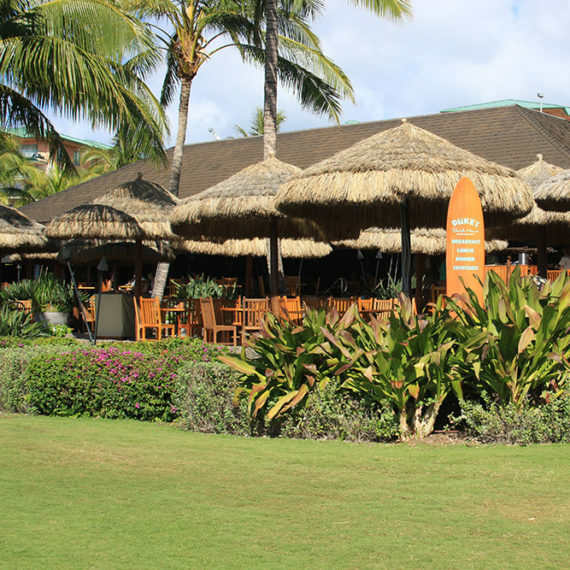 Appearance: Very large octagonal bar w/ an 12.5′ dia thatched roof (although many opt to upgrade to a 14′ diameter roof) that stands just over 10 ft tall. 6 counter-topped sides are standard, with a common option being a full-height 7th side shelving unit for storage. Grade (Int. vs. Ext. ): Both, but considering the sheer size of the structure, almost exclusively used outside. Seats: Up to 10 people, with ample room for two bartenders. Ease of Installation: Moderately difficult installation. Requires 4 people, and may take several hours. Complete detailed installation instructions are included with your purchase. Custom Options: Custom resin-poured, or Safari’s GRASSBuilt engineered bamboo, electrical outlets, and choice thatch, as well as sinks, appliances, ceiling fans, lockable shutters and more. Talk to your sales rep, as most customer requests can be accommodated. 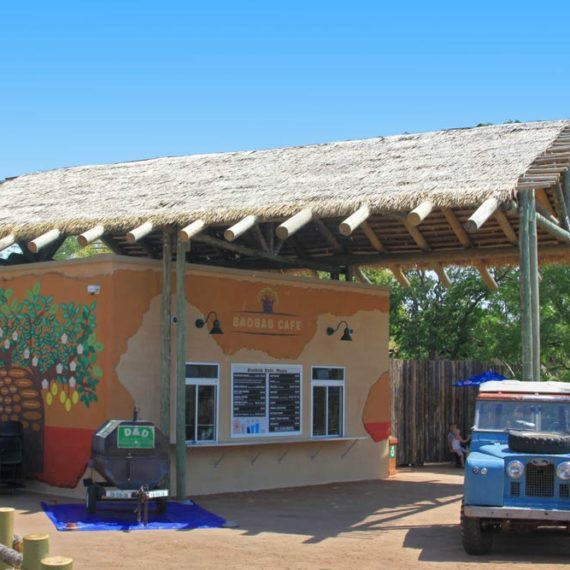 Materials: Bamboo plywood, bamboo poles, GRASSBuilt Counters, thatch of your choice, galvanized steel frame.